This journal of a heavy cavalryman is a rare thing in itself as we are not blessed with many memoirs from this arm of the cavalry; unlike the light cavalry who seem to have written profusely. 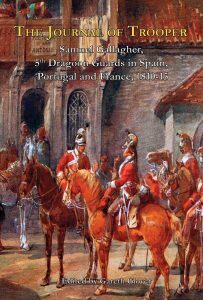 Indeed, regarding the 5th Dragoon Guards itself, this is the only published memoir, hence its great importance. I have therefore been keen to produce it for some time. I have been in possession of a typed copy of the journal (the present whereabouts of the original are not known) which is held by the National Army Museum, Chelsea, under the Reference 1968/07/213. However, it is unsigned and is simply recorded as ‘The Memoirs of An Unknown Dragoon’. I have therefore delayed publishing it until I finally had the opportunity to visit Kew and to do some detective work. I am very glad to say that after two hours of searching the Regimental Musters I was able to identify only one candidate who had served in all of the three regiments mentioned and whose dates matched. I am very glad to confirm that when I then called up Trooper Samuel Gallagher’s service records, it matched exactly with everything claimed within the memoir (with a few minor discrepancies in dates) and this has allowed me to confirm with great certainty that it is both written by him and is the genuine account of a heavy cavalryman. Samuel is a little reticent over his personal background which we can discover much of from his service record, but more intriguingly, it casts doubts on his claims for his reasons for changing regiments. He claims to have changed into the 10th Hussars in 1815, to see action, but was devastated to miss the Battle of Waterloo; he then claims that in 1820 he became keen to serve in India and switched once again to the 11th Light Dragoons. However, his service record, which I show below in full, actually shows that he had risen to the rank of sergeant in the 5th DG, the 10th Hussars and the 11th LD and served in that rank for significant periods; but just before he transferred to each regiment and again just before he left the army, he was reduced in rank to private! This clearly shows that on two separate occasions he was busted from sergeant to private and once from corporal, but unfortunately we are not privy to the causes of these punishments. Indeed Samuel left the army in 1838 as a simple private. Whatever the cause, (I have a suspicion that it was drink related) it seems to have been a greater cause of his wish to move to a new regiment, more than any desire for action or foreign travel! Samuel Gallagher was born in 1790 at Rathmelton (or Ramelton), a small village which lies at the mouth of the River Lennon in County Donegal. He was attested into the Army on 16 July 1807 at the age of 17 years and 6 months, hence he had been born in the February. Samuel saw action in the Peninsular War covering the sieges of Ciudad Rodrigo and Badajoz, the actions of Usagre and Llerena, Battle of Salamanca, entry into Madrid and subsequent retreat, the Battle of Vitoria and blockade of Pamplona, followed by the Battles of Nive, Orthez and Toulouse. Remarkably he was never seriously wounded during his career. He unfortunately joined the 10th Hussars in 1815 just after Waterloo.